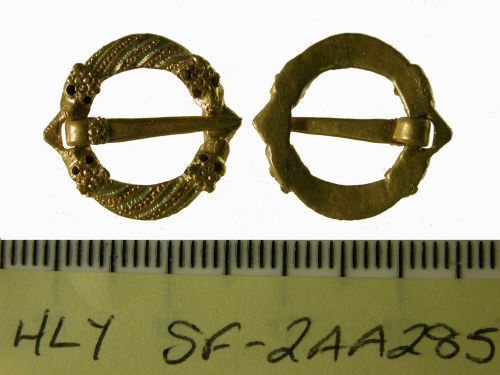 Medieval gold annular brooch with animal head terminals, D-shaped in section. It is cast with four animal head terminals, two grip the loop for the pin and the other two grip the falttened section where the pin rests. Each head has two collets for eyes, the settings of which are present in the two gripping the pin loop but missing in the others. The pin is intact and seperately cast. It is triangular in shape and has a decorated ridge where the loop meets the shaft and tapers to a point. The reverse is flat and undecorated. The brooch is c.1300-1400 in date and is similar to other brooches from the period, for example from Stowmarket, Suffolk (2002 T49) (Treasure Annual Report 2001, p54, no 82).